Eight- and six-string guitarist Tom Lippincott was born in New Jersey and grew up in Tulsa, Oklahoma, but has made South Florida his home since 1988. He has a bachelor’s in jazz studies from the University of North Texas as well as a master’s in jazz performance from the University of Miami. Tom currently teaches jazz guitar at Florida International University, Miami Dade College, and Broward College. 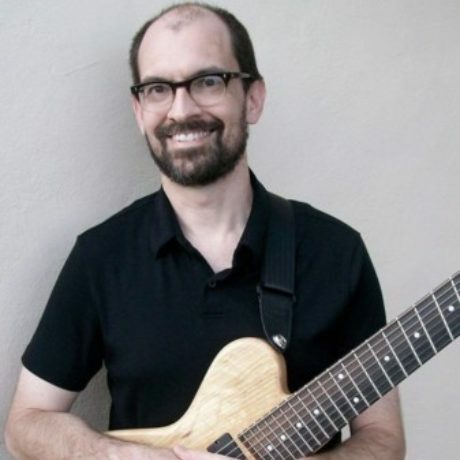 He also teaches privately in person and via Skype, conducts clinics and workshops, and has jazz guitar classes available online through Mike’s Master Classes. As a performer, Tom has played throughout the world as a solo guitarist and in many different group configurations. He’s had the opportunity to perform and/or record with such jazz luminaries as Ed Schuller, Don Friedman, Gary Campbell, John Stowell, Ben Monder, Jonathan Kreisberg, and Dave Liebman. He has also played on several recordings, including his own 2000 release, Painting the Slow Train Brown.